Mold – a four-letter word that is not only unpleasant to look at but also hazardous to one’s health and safety. This common household problem also emits a foul, musty odor and can be a sign of something more problematic – water leaks. One of the common areas in your home where mold growth is likely to occur in the basement. This article will help you resolve the mold problem on your own. It covers two basic steps to follow: moisture control and mitigating the mold. What Causes The Growth Of Mold? Simple water leaks can already a cause the growth of mold in your basement, especially when it’s been neglected for a long period of time. It doesn’t need much to go on and spread and it feeds on almost anything it is attached with such as the wood. Normally, it appears on floors, ceiling, and walls of homes and even offices. Mold and mildew are often confused as the same thing; basically, it’s true, however, when you refer to mildew, these are minor mold problems that can be usually found in the bathroom. Molds, on the other hand, can be severe and may cause health problems such as asthma, allergic reactions, respiratory problems, and even death. Its common victims include young ones, elderly, and anyone with a weak immune system. 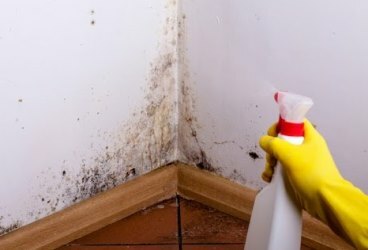 The difficulty of removing a mold from one’s home depends on the severity of the mold; some can be resolved on your own while others may require professional assistance. Therefore, it’s best to mitigate it in the soonest possible time. Some molds can be spotted easily; it appears in various shapes and colors such as green, black, blue, white, or combination of these colors. Unfortunately, there’s really no way to eradicate mold and mold spores indoors but there are a handful of solutions to control it. One of which is to resolve water problems, such as leaks. Frequently check all the areas in your home, including the basement, for any sign of leaks. Clean and dry these areas immediately to avoid mold growth. It’s also necessary to keep your property well-ventilated to reduce indoor humidity. Air conditioners and dehumidifiers also help in preventing a room to become warm and stagnant. Another way of controlling moisture is to insulate roofs, windows, pipes, and exterior walls. This is important so as to avoid condensation, which eventually leads to moisture formation and molds. It’s beneficial to do a bit of research first to know the most effective commercial mold remover in the market; otherwise, you can stick to using bleach. Find the infected areas and assess the damage to know whether it’s severe or not. If you think it’s hard to remove, call a mold removal company to assist you. If it’s not still a major problem, you can start scrubbing the entire area.